It has been fifty-five years since Shakespeare’s Romeo & Juliet was re-located to New York City and transformed into the musical West Side Story. In place of the feuding Montague and Capulet families of Verona we are given two rival New York gangs – the Jets and the Sharks. The white Jets are led by Riff, the Puerto Rican Sharks by Bernardo. Romeo becomes Riff’s best buddy Tony; Juliet becomes Bernardo’s younger sister Maria. The movie has a New York City feel about it but, surprisingly, most of it was shot on a sound stage in Hollywood. Those scenes that were shot in Spanish Harlem (around East 110th Street) were subjected to quite a bit of anti-social behavior from locals who threw rocks and dropped objects from above onto the performers in the streets below. Eventually, the film-makers were compelled to hire a street gang to protect their players! Elvis Presley’s manager Colonel Tom Parker knocked back a genuine attempt to have his boy play the male lead Tony. He preferred his meal ticket to stick with the mundane, inoffensive, sappy musicals he usually played (much to Presley’s chagrin). Elvis carrying a switchblade was contrary to the image Parker had built up for him over the years. Besides, the thought of ‘the King’ starring opposite his ex-girlfriend Natalie Wood did not exactly fill the Colonel with enthusiasm either. So, exit Elvis. Marlon Brando also wanted to do it, but he was 34 years old at the time, and this was supposed to be a picture about teenaged gang members. Tab Hunter (30), Richard Chamberlain (26) and Burt Reynolds (26) were also rejected because of their age. Singer/actor Bobby Darin would have been perfect, but he was in great demand elsewhere and was simply too busy. Heart-throb Warren Beatty even tested alongside Natalie Wood, (his real life girlfriend), but in the end the powers that be went with the little known Richard Beymer. It looked as if Audrey Hepburn would get the much sought after role of Maria, but she fell pregnant with Mel Ferrer’s child and had to withdraw from the race. United Artists, therefore, pretty much settled on giving the part to Natalie, but there was a potential problem emerging with her boss Jack Warner. She knew that if she refused to do Parrish for Warners he would never loan her out to UA for West Side Story, so she faked a bout of tonsillitis which got her out of Parrish at the last moment. Interestingly, Stefanie Powers was hired as a chorus dancer (under her then stage name Taffy Paul), but was replaced because she was under-age. Years later, she and Natalie’s husband Bob Wagner would co-star in TV’s Hart to Hart. The project was so huge that UA decided to split the workload between two directors, Jerome Robbins for the song and dance numbers, Robert Wise for the dramatic scenes. It was not a good idea. Robbins had never directed a movie before, only stage plays. Wise had never directed a musical before. Robbins’s perfectionism had Natalie working 16 hours a day and becoming crankier by the minute. Her dancing and singing were nothing to write home about, yet she complained about Beymer’s lack of ability in both areas and called for him to be fired! Ultimately, she and Beymer sorted out their differences, Wise was given full control over the remainder of the shoot, and methods were devised to work around the dance limitations of the two stars. They had severe singing limitations, too. The legendary Marni Nixon did all the vocals for Natalie, just as she did for Audrey Hepburn in My Fair Lady (1964). Natalie was kept completely in the dark about this. Perhaps, she might have been less critical of Beymer’s singing and dancing had she known that her vocals were not going to be used in the final cut either. A gentleman named Jimmy Bryant dubbed for him. Desperately short of money, he agreed to do the dubbing for scale pay rates and no residuals. Rita Moreno, who played Bernardo’s sister, Anita, sang on the ‘America’ number, but was dubbed in all the others. Leonard Bernstein composed the songs. He generously donated a portion of his percentage to Marni Nixon after United Artists flatly refused to give her any royalties for singing Natalie’s songs! Before Natalie became available the superb singer Anna Maria Alberghetti was the front-runner to play Maria, but once again (it happened a lot to her) she missed out on a role she could have played beautifully. Richard Beymer is an interesting individual. He is still alive today. As far as he was concerned he hated his performance in this movie. He wanted to play Tony as a far tougher character, but was stuck with a sappy, too good to be true, portrayal that embarrassed him. In fact, the story goes that he was so ashamed of his performance that he walked out of the London premiere half-way through the picture, thereby making himself unavailable to be introduced to the Queen of England afterwards at the cast reception. While starring in Hemingway’s Adventures of a Young Man, in Italy in 1962, he met a young and beautiful high school student who was an extra in the picture. They entered into a relationship a year later and the girl heeded his advice to actively pursue an acting career. The girl’s name was Sharon Tate, the future wife of Roman Polanski and tragic victim of the Manson Gang in 1969. During ‘The Taunting Scene’ Rita Moreno (playing Anita) became deeply distressed and was reduced to tears as the Jets harassed her. The scene brought back childhood memories of the time she was raped in real life. When they eventually completed the scene Rita admitted that she delivered her line, ‘Don’t you touch me!’ in her very best Marlon Brando impersonation. He was her boyfriend in private life at the time. If you watch closely during the prologue, when the Jets take a basketball from a couple of kids and play with it, take note of the kid who catches the ball when the Riff tosses it back. He is Christopher Culkin, father of the future superstar child actor Macaulay Culkin and brother of Die Hard leading lady Bonnie Bedelia. This movie brought the name of Russ Tamblyn to a worldwide audience when he played Riff, the volatile, bad-tempered, knife-wielding leader of the Jets. Russ had begun taking dancing and acrobatics lessons at the age of six, and his enormous talent became evident very quickly. MGM picked him up as a ten year-old and he made several movies for the company. His agility was never more apparent than in Seven Brides for Seven Brothers (1954) where he played one of the dancing brothers. He was also very good in the title role in tom thumb (1958), but it was West Side Story that really brought him fame. Strangely, he virtually disappeared from screens after that. A smallish role in The Long Ships (1968) was followed by a couple of decades of B-features before he landed the part of the psychiatrist Dr Lawrence Jacoby in the TV series Twin Peaks (1990). 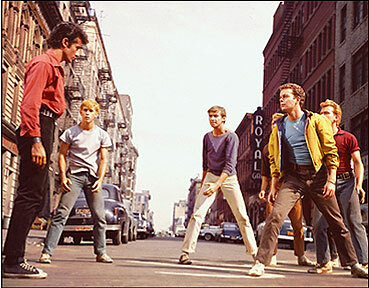 West Side Story was the #2 grossing movie of 1961, being beaten out of the top spot by Disney’s 101 Dalmations. Costing just $6 million to make, it pulled in about $43 million over the ensuing decades. In Paris it played for four straight years at the George V Theater, creating a record. The picture inexplicably picked up ten Oscars, the most ever by a musical, including Best Picture. Rita Moreno won for Best Supporting Actress and George Chakiris’s win for Best Supporting Actor still has people scratching their heads and wondering ‘How?’ Both Wise and Robbins shared the Best Director Oscar; Wise going on to win another for The Sound of Music in 1965. Robbins never directed another movie in his life, which makes his victory for the only picture he ever directed unique in itself. Even more so when we consider it was for only half a movie. Yvonne de Carlo – A rare beauty. I was 6 yrs. old when the movie came out. Was never aware of it until I was in the 8th grade playing tuba in JFK High School Band (Richmond, Va.), where our band teacher (late great John Peyton) had the band playing the music score. That’s when I fiest heard of the great Leonard Bernstein. I hated the score. It intimidated me. The one piece that struck my attention was “I Feel Pretty”, followed by “Maria” and “Tonight”. The band played it for the spring concert. Years afterwards, I never realized how great the movie AND the soundtrack was until I saw it on TV. The it hit me like a bolt of lightning. BAM! I was in awe! First, I thanked my music teacher for exposing me to it and really appreciated what he did and what the movie was all about. The acting, the singing, the dancing, even the jazz segment “Cool”. I have looked at the DVD at least once a year for the past 35 years or so. Just finished looking at it yesterday, as well as the video clip of Bernstein directing the orchestra and popular opera singers during a studio recording. It was amazing! West Side Story and The Godfather are my 2 top movies I traditionally look at over and over again. Both are truly a masterpiece! One thing I have learned about movies, Dennis, is that everyone’s taste varies. You love ‘West Side Story’; I have always disliked it intensely, yet we both love ‘The Godfather’. It seems that the whole world loves ‘The Sound of Music’ – I HATE the bloody thing! Most of America disliked ‘Paint Your Wagon’, I thought it was good fun! Difference of opinion is what makes the world go around. Thankyou for your comments. They are much appreciated.